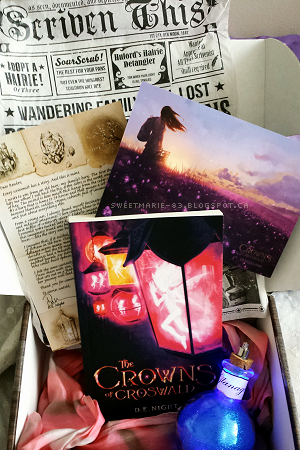 My review copy of Crowns of Croswald came from the publicist with all these amazing extras. Hands down one of the coolest packages I've ever received! I'm obsessed with the Glanagerie bottle, and after reading the book and finding out their purpose, I love it even more! Thank you JKS Communications! 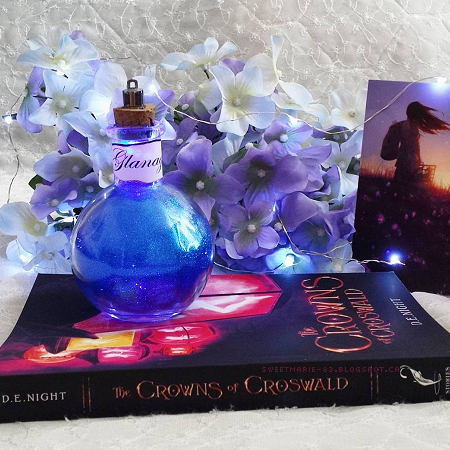 The Crowns of Croswald is a fun, fresh fantasy from debut author DE Night. Despite some similarities to Harry Potter, Night has managed to take the familiar ‘orphaned child sent to magical boarding school, destined for greatness’ premise and create a different, compelling world. Sixteen-year-old Ivy has lived her entire life shut away as a servant for a royal family, with only a pack of scaldrons (dragons, whose job it is to cook food in their mouths) and a dwarf who turns up occasionally as companions. When she turns sixteen, an accident in the kitchen gets her thrown out of the castle, but she soon finds herself on her way to Croswald and the Halls of Ivy, where she’s set to learn to be a scrivenist, a magical record keeper. I loved the world of Croswald and the Halls of Ivy, the concept of magic and the roles of magical people, the magical creatures, and of course Ivy herself. She's strong, smart, brave, impetuous, and curious, and it was so much fun following along on her adventures. 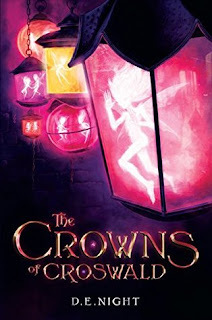 With lots of action and magical antics, plenty of mystery to keep you guessing, and a great cast of characters, The Crowns of Croswald is sure to be a hit with fans of fantasy. If you’re a teacher/parent/guardian who’s looking for something new and fun for your tween or teen, make sure to pick up The Crowns of Croswald. Ivy is sixteen, which automatically made my mind go ‘this is YA’ but it reads like a Middle Grade book, so I think it’ll have wide appeal, regardless of the readers’ age. I can’t wait to continue on with this series and see what’s next for Ivy and her friends. Have you read The Crowns of Croswald? What did you think? If you haven't read it, do you plan to? Do you like fantasy?